If you’re near the Empire State Building, don’t miss the Korean BBQ lunch at Kristalbelli. 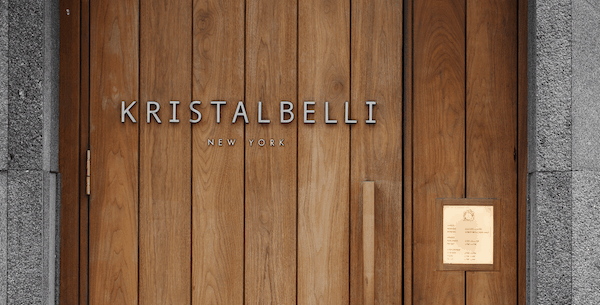 When you escape the hectic streets of Midtown Manhattan and walk through the heavy, oversized, wooden entrance door at Kristalbelli on 36th Street off Fifth Avenue, you enter a long narrow space that makes you feel as if you’ve suddenly been transported someplace else. Although located only one block north of Koreatown, the ambiance here is decidedly more upscale that many of the other wonderful nearby eateries. In fact, Kristalbelli tops Zagat’s list for New York City’s Best for Korean BBQ. Because it is located within walking distance of both Grand Central Station and the Port Authority, it seemed like a perfect lunch spot to meet a friend from New Jersey. We came away wowed. For an amuse-bouche, our waiter served each of us a single taro chip with a paper-thin slice of saucisson topped with a dollop of blue cheese vinaigrette. The tastes and textures were a great start. The extensive lunch menu offered cold and hot appetizers, noodles and rice dishes, soups and barbecue entrees. Although we had read about the wonderful pork dumplings, there were none to be had at lunchtime. The waiter told us that the place had been extremely busy the night before and they completely sold out. Instead we shared an appetizer of haemool-pajeon, mixed seafood scallion pancakes, grilled to perfection and served with a tangy Ponzu sauce. Both boxes included miso soup, housemade kimchi, beansprouts and pickled seawood salad. Everything we tasted was fresh and delicious. Service was attentive and the dishes (and boxes) were beautifully presented. The portions were so ample that there was plenty leftover to take home for not-so-lucky spouses. Kristalbelli is owned by the JYP Entertainment group, a large entertainment conglomerate based in Seoul. The creative menu of this concept restaurant is described as Korean Fusion, a modern twist on the traditional. Chef Kay Hyun, a graduate of the French Culinary Institute, does a terrific job in its execution. 1) The meal was interesting, delicious, and reasonably priced given its quality. 2) I still want to taste the dumplings and legendary popcorn ice cream. 3) I would love to try the three-course prix fix dinner (at $45 per person) and get to taste meat grilled on the Buddha’s belly. BTW, it’s a great choice for tourists visiting the Empire State Building just around the corner. This post is part of a linkup with Budget Travelers Sandbox. That looks so good! I love lunch menu pricing. It’s so much more budget friendly. OK, that’s it! I’m committed to going to this Korean BBQ joint – even if it is upscale, fushion – next time I’m in NYC midtown area. Sounds fantastic! Wow! I was thinking from your photos there had to be a little French somewhere among the Korean cuisine, and I felt so validated to learn that the chef was French trained! LOL What an amazing bargain for Manhattan this is! Everything looks delicious and the location, as you say, is prime for tourist visits. What a great find. I thought Kristalbelli was a great find, too. I’m yearning to return. Ooh – Yum! Here I am, salivating and dreaming of good Korean food and not a restaurant anywhere nearby… Hope to get to NYC this fall and will definitely remember Kristalbelli’s! Guess I’ll just have to keep dreaming and looking at your photos! I didn’t realize how few Korean restaurants were in my neck of the woods either. Tried one in Westchester today and it paled compared to Kristalbelli! I shouldn’t read posts like this before dinner! NYC is a wonderful place for Korean food, but I’m surprised (and delighted) to learn about Kristalbelli’s right in Mid-Town. On my list! My visit has inspired me to learn more about Korean cuisine. I will be visiting NYC next week and am on the lookout for good places to eat. Kristabellic Korean BBQ sounds like a delicious option, but I will be bopping around with vegans so won’t work this time. However, it reminds me that I remember going to a vegan-vegetarian Korean place in NYC on a past visit, so maybe we’ll try that one again. How did you know what to choose? My husband is there right now and staying in Midtown and I am forwarding this post! Thank you for finding such a cool spot with delicious food.